Shears have a well organized design for comfortable usage and four plate springs to absorb the cutting shock. 5-Star Cutting Shear by Matteck Matsuzaki -MM Cobalt -Shippoo Thumbscrew -Available size: 5.25" and 5.75". 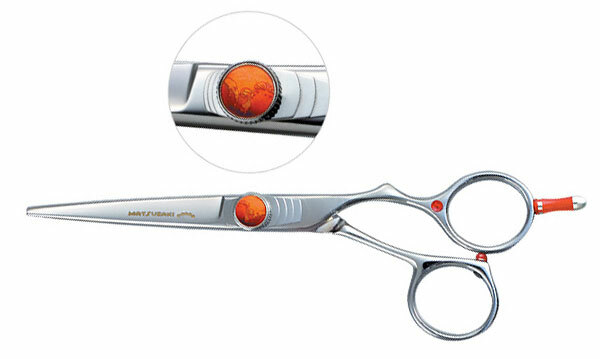 This model is one of the most popular and long seller unevened warp type cutting scissors being accepted by top stylists and veteran hairdressers, which has a well organized design for comfortable usage and four plate springs to absorb the cutting shock under the beautiful orange Shippoo* pivot screw. This is one of recommendable model for your collection. *Shippoo is a beautiful china produced in AD 700s for the first time in Japan which can be finished by heated color enamels. We use Shippoo as the top cover of the pivot screw of the model shown. High grade material of Matsuzaki Original containing Cobalt with special steel. It is suitable to make a straight cutting line. It has a smooth cutting feeling. This is normal style of back of blades.This is used in many ways, blant cutting and others.